Old Banknotes: Provincial Bank of Ireland, General Issue 1918, Series C.
As was the case with other Irish banks, the Provincial Bank of Ireland introduced a modernisation of its banknote issues in the immediate post-World War 1 era. It initially appears to have followed the lead of Bank of Ireland by reducing the size of its £1 note issues, though only slightly, to produce Series C.
Banknotes of the Provincial Bank of Ireland underwent several changes in a short period of time which gave rise to some very rare and short-lived issues. Unlike the banknotes of other Irish banks, the redesign of the note issues by the Provincial bank lead apparently to alterations of just its £1 notes in circulation, with no evidence of modernised versions of higher denominations entering circulation, though modernisation of other denominations was underway. After issuing one date as reduced size notes, which ran to less than one prefix, it adopted a small size note issue in early 1919 which was very similar in size to the £1 notes of the National Bank, and to the 1919 Third Issue of English Treasury notes. This became the standard size range for £1 notes of all the Irish banks, including those of the Currency Commission. 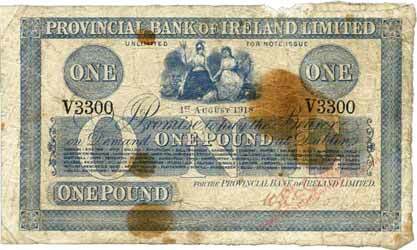 The reduced size £1 note issued by the Provincial Bank of Ireland in 1918, may best be described as a hybrid interim series. It bridges the gap between the large size older notes in use up to 1918, and the small size notes introduced in 1919, sharing features of both the earlier and later designs. Uniface. Head Office DUBLIN. 63 branches in sans-serif script. Central panel with branch listings and large ONE redesigned from Series B; date in serif uppercase typeface. Size: printed area, 192 x 108 mm; paper size similar to earlier issues, approximately 208 x 120 mm. One Type, hand signed W. Wilson. One date only. An image of every date of each denomination of Series C, D and E is in Provincial Bank of Ireland 1918-1927 Date Listings: Series C £1 Notes, 1 date.